Foxgloves are biennial, like shade or partial shade, flower from May to August and are one of the most instantly recognisable native British wildflowers. Other names for this well loved flower are fairy thimble, fairy caps, bee catchers, witches’ gloves/thimbles, lion’s mouth, dead men’s fingers, goblin’s gloves and The Dartmoor cowflop. Xcellent for attracting bees and butterflies into your garden and particularly loved by Heath Fritillary butterflies and moth species such as the Frosted Orange and Lesser Yellow Underwing. Leaves of the foxglove were placed in children’s shoes as it was believed that it prevented them from catching scarlet fever. 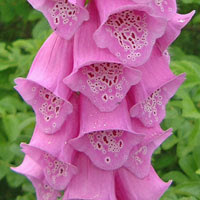 Official name for the foxglove is Digitalis purpurea. Very poisonous if eaten. It is the source of the drug digitalis which is used in controlling heart rate. Each plant produces 1-2 million seeds. I recently re-read a book that my great Aunt wrote in 1981 about my family history and found this recipe for Oatmeal Gingerbread which I thought I'd share with you. In this book is a copy of a handwritten page from an old ledger containing traditional recipes used by my family. Warm one pound of syrup and melt half a pound of lard. While this is doing, mix in a dry basin one pound of oatmeal, half pound of flour, quarter pound of sugar, 2 teaspoonfuls of baking powder, the same of ground ginger, one teaspoonful of mixed spice and a pinch of salt. Now stir in the warmed ingredients and a teacupful of milk. Pour at once into a well greased tin and bake in a slow oven for two hours. There was also this recipe which allegedly provides a cure for dizziness. I don't know about a cure for dizziness, but it certainly sounds like one for constipation! Boil in one quart water. Bring down to a pint. One wineglass full to be taken every morning. 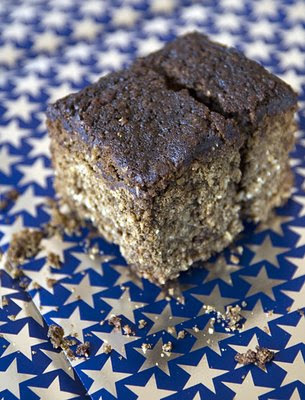 Anna at Baking for Britain has a great article about the origins and history of Parkin (or Perkin or Tharf cake) with full details on how to make it. Welcome to the February 26, 2008 edition of a carnival of country living. A great selection of varied topics which I hope you enjoy. I was particularly interested in learning how to read your dog's body language - I will have to study Bob and Percy more closely! GP presents The Kitch from the Kitchen posted at Inside Montana - Your home at the Range, saying, "Tips from innside a green kitchen and a recipe"
Louise Manning presents Renewable energy and rural development posted at The Human ImprintWinter Rabbit Care posted at Adventures in the 100 Acre Wood. Stephanie presents Make Your Own Suet posted at Stop the Ride!. GP presents The 10 Commandments of Horse Management posted at Innside Montana-Your Home at the Range, saying, "The 10 commandments of equine management!" Cindy Yeager presents Very pregnant ewes posted at Ewe & I Farm, saying, "On our blog we share life as it happens on our farm and in our family." DoggieWoggie presents Learn Your Dog’s Body Language posted at Doggiewoggie - All About Dogs. Chickens in the Road presents Make Your Own Wild Bird Suet posted at Author Suzanne McMinn, saying, "Make your own homemade wild bird suet!" Laura Williams presents Spaghetti Casserole posted at Laura Williams' Musings. Thomas Carlyle presents Cooking Lesson: Getting Roasted posted at Angie's Pangies, saying, "Angie Younce talks about trying to find specialty food items while living in a rural area." With spring fast approaching we are all thinking about great days ahead in the garden, but beware, you may not be as safe on your little patch of green as you think. Apparently men have more accidents than women (make of that what you will!) and people aged 30-60 are more likely to come a cropper. I must just add at this point that the accidents involving plant containers stem from people tripping over them or strains caused when lifting and not because there are lots of psycho pots out there! Are raised beds the answer? Hannah, the Wiggly Wigglers gardener, is a big fan of raised beds and says that the benefits far outweigh the extra bit of work making them initially. You could always take the easy route Hannah and order some Link-a-Bord kits! Raised beds should be no more than 1m wide so that you can reach the middle from each side so as to avoid walking on the beds and damaging the soil structure. You should aim for a depth of at least 6” for your raised beds. Raised vegetable beds are good for anything with a long root and you can improve drainage by adding sand, which is perfect for growing the best carrots. Asparagus is also particularly appreciative of free draining soil. The addition of loads of well rotted manure is perfect for growing forkfuls of beautiful spuds. If you have several raised beds it makes crop rotation a doddle. Last, but certainly not least, it helps with creaky knee syndrome and is a place to rest with a cup of tea to admire the fruits of your labour. The only trouble is getting up again! With today being the last day of nest box week, I thought it might be timely to offer a few top tips about bird boxes.